J.J. Lynn's insurance company, Universal Underwriters Group, was named for the "universal car" of the time, the Ford Model T. After World War I, the same economic downturn that put Harry Truman out of retail business in 1922, put pressure on the auto industry. Ford dealerships were required to reduce auto prices between $6 to $15 on different models. New prices ranged from $285 to $645. In this environment Ford dealers looked for less costly insurance. They were lumped together by insurance companies with blacksmiths and other professions that often used dilapidated buildings. Authorized Ford dealers, however, used buildings of superior construction and felt they were overcharged for insurance. 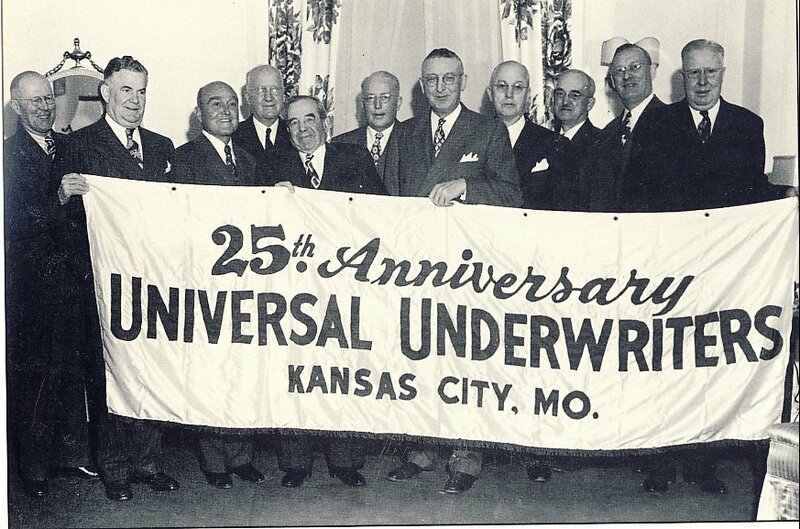 Eighty-five Ford dealers formed Universal Underwriters in Chicago in 1922, but after five months they had more business than they could financially handle. Sam Wells went to Kansas City and approached James Jesse Lynn, who was by this time owner of U.S. Epperson Underwriting. They hoped he would be interested in a 50 percent interest in the new company. Lynn was looking for areas of expansion, but he wasn't interested in 50 percent. He would consider 100 percent. The company was moved to Kansas City and housed in the R.A. Long Building. J.J. Lynn's younger brother, Eugene Lynn, Sr., who was a CPA, was named secretary of Universal Underwriters. The company grew more that ten-fold by 1929. Then business dropped off by about 70 percent with the Depression. In 1931 authorized Chevrolet dealerships were added to the business in order to expand premiums. Claude McReynolds worked for J.J. Lynn's very profitable expansion into the oil business, beginning in 1938. "J.J. called me in his office and told me he was going to expand his oil operation and wanted me to oversee the operation. It was called the 'J.J. Lynn Oil Division' and he made me manager, knowing nothing of oil." In the middle of a large Illinois oil field, a stubborn farmer held out for $50,000.00 as the price of a lease on 100 acres. The larger, experienced operators wouldn't take it. Lynn paid the $50,000 and got a dry hole for a start. The second drilling job produced one of the best wells in the field. The oil business was extremely lucrative when J.J. got involved. He was intrigued with the 27.5 percent oil depletion allowance. It became the largest of his enterprises. After his small start in Illinois, J.J. expanded this venture to include wells in Kansas, Oklahoma and Texas, with a total of 200 wells by the time he sold out. McReynolds was one of the few people who knew J.J. Lynn early in his career and was associated with him until his death. "Jimmy was a man of his word, I'll say that for him. He was a smart man. He never forgot anything. I'll never forget about 1938, I was in his office and he said, `Claude, do you know we're starting to get into this war?' and that was about three years before we got in it. He said, 'We just can't keep out of it." He seemed to always be aware of not just what was affecting him personally, but the world around him. J.J. was a private man who, by the 30s, kept to himself. J.J. was seen by some as an eccentric. McReynolds recounted some of J.J.'s eccentricities: "He drove a Packard convertible. And along about 5:30 or so, why it didn't make any difference really how cold it was, here the nose of that Packard would come out of the parking lot on the north side of the R.A. Long Building on Grand Avenue, with the top down and J.J. dressed often in short sleeves, no tie or jacket ... J.J. loved the outdoors. "He had an estate which was between Meyer and 63rd Street and Prospect, with a nine-hole golf course. Each morning, and again, it didn't make much difference as far as the weather was concerned, but down in the west end of the estate was a grove of trees and he did his exercises. He'd stand on his head for minutes and minutes. He often did this in his office. He became a vegetarian, drinking quarts of carrot juice." What many didn't understand was that his practice of yoga was part of his religious belief. He loved the outdoors. He spent his time from early spring to late fall in KC, and in winter he spent all possible time in Southern California where he could continue to spend time outdoors. J.J. got involved in the Self-Realization Fellowship after he met Paramahansaji Yogananda in January 1932 in Kansas City. On July 10, 1930, J.J. Lynn lost his brother, Eugene Lynn, Sr., to a plane crash. Eugene Lynn had become a prominent KC accountant and head of his own company as well as secretary of Universal Underwriters. Returning from a fishing trip near Corpus Christi, Texas, four other prominent Kansas Citians died including Raymond Watson, grandfather of Tom Watson the noted golf pro. J.J. Lynn's brother was 32 years old when died and his surviving children were Eugene Lynn, Jr., 11 years, and Freda, 7. The son, Eugene Lynn, Jr., became flight instructor in WW II and then a TWA pilot. He started working for his uncle in 1946. J.J. Lynn, turned the operation of Universal Underwriters over to Eugene, Jr., in the early 1950's. Eugene purchased his uncle's insurance companies from J.J. Lynn in 1954 with a purchase note, but this was not made public until after the passing of J.J. Lynn in 1955. Before his passing, J.J. Lynn transferred the purchase note to Self-Realization Fellowship. In 1961, Eugene Lynn received an offer from SRF to settle the unpaid balance of the purchase note of $1,000,000 for $883,465, plus unpaid interest. Eugene Lynn took advantage of this prepayment discount by taking a five-year bank loan. 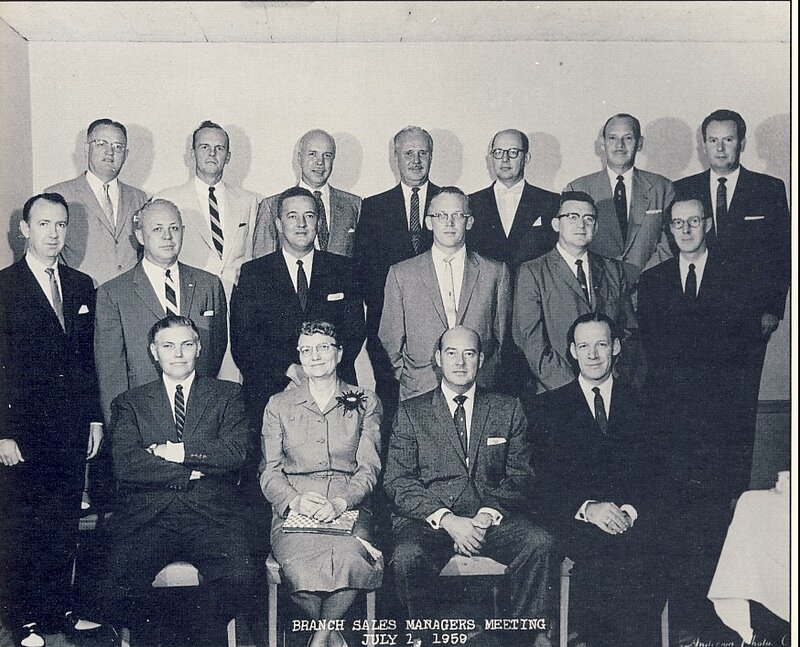 UUIC 1959. J.J. Lynn's nephew, Eugene is bottom row, second from the right. T.R. (Ted) Krings, bottom row far left, by some accounts was the only associate of J.J. Lynn's who was interested in Lynn's spiritual pursuits. 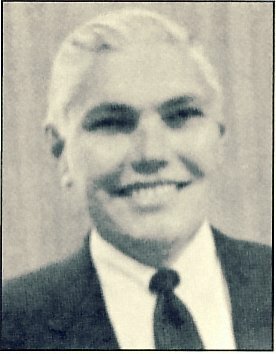 Krings retired as CEO of Universal Underwriters of Kansas City in 1978 after 44 years with the same company. He was a Veteran of World War II, serving as a pilot in the Army Air Corps Troop Carrier Command in the European Theater. Krings passed away in 2005 at age 89.